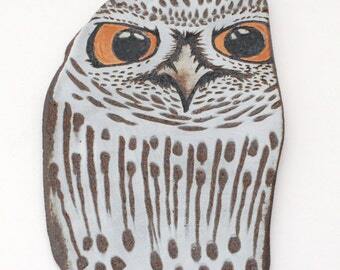 Comrades is a porcelain sgraffito technique owl wall hanging that arrives ready to hang. 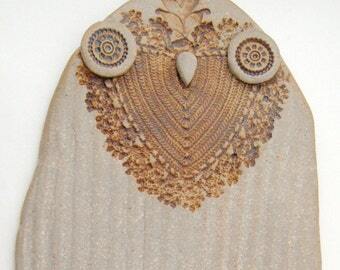 White porcelain slip was applied to a chocolate brown clay slab at the leather hard stage which was then carved and sketched by hand to reveal the depiction of the snowy and eagle owls. 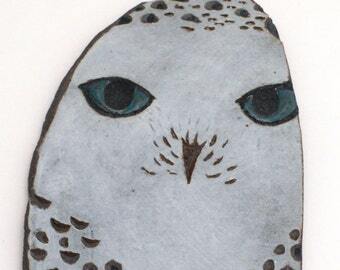 Black stain was brushed on around the eyes and beaks and a papaya orange underglaze was applied to the eyes of the owls. The tile was fired to a high-fire cone 10. All but the eyes of the two "Comrades" is a raw clay finish. 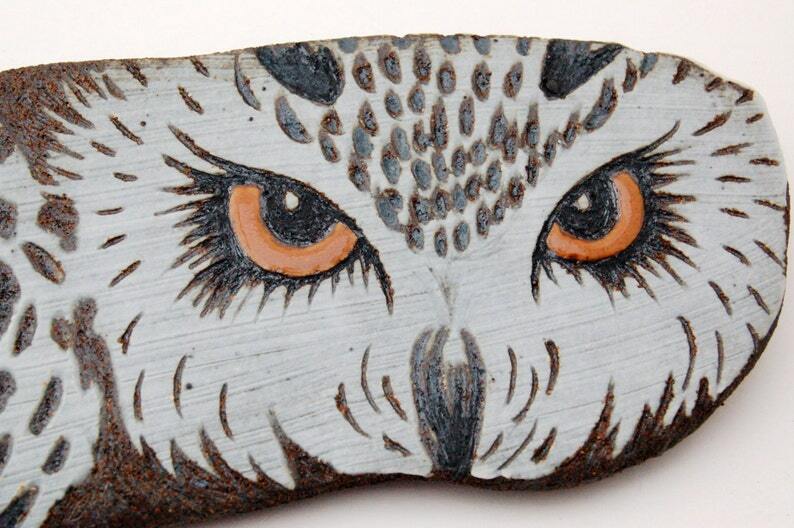 Because there is some silica in the underglaze, the eyes have a smooth, high gloss finish. 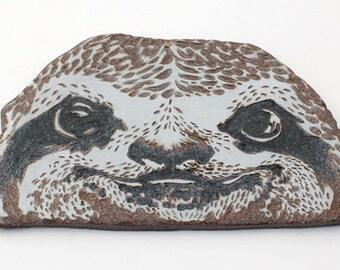 The Comrades measure nearly 8 inches long by 2.75 inches wide. The tile is a quarter inch in thickness. Should you want to use Comrades as an actual tile, mortared into a layout of sorts, the D-ring glue backed disks are easily removed by soaking them in water. The intense stares of these Comrades would make a dramatic statement anywhere in your home or office. 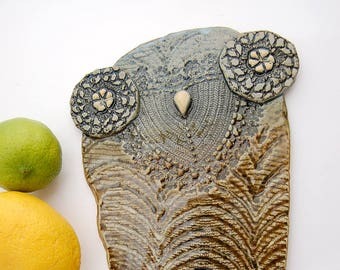 Ceramic Owl Wall Hanging - Porcelain Sgraffito Raptor Wall Art - Ceramic Bird Tile - Fine Art Pottery Home or Office Decor - "Snowflower"
Ceramic Owl Wall Hanging - Owl Wall Art - Ceramic Owl Wall Tile - Ceramic Owl Home and Office Decor - Fine Art Ceramic Owl - "Magdalena"
Ceramic Owl Wall Hanging - Owl Wall Art - Ceramic Owl Wall Tile - Fine Art Ceramic Owl Home Decor - Owl Home or Office Decor - "Eugenia"
Ceramic Owl Wall Hanging - Owl Wall Art - Ceramic Owl Wall Tile - Fine Art Ceramic Owl Home Decor - Owl Home or Office Decor - "Klaus"
Ceramic Owl Wall Hanging - Owl Wall Art - Ceramic Owl Wall Tile - Fine Art Ceramic Owl Home Decor - Owl Home or Office Decor - "Doris"
Ceramic Owl Wall Hanging - Owl Wall Art - Ceramic Owl Wall Tile - Fine Art Ceramic Owl Home Decor - Owl Home or Office Decor - "Ronin"
Ceramic Owl Wall Hanging - Owl Wall Art - Ceramic Owl Wall Tile - Fine Art Ceramic Owl Home Decor - Owl Home or Office Decor - "Duo"
Ceramic Owl Wall Hanging - Owl Wall Art - Ceramic Owl Wall Tile - Fine Art Ceramic Owl Home Decor - Owl Home or Office Decor - "Swenson"
Ceramic Owl Wall Hanging - Owl Wall Art - Ceramic Owl Wall Tile - Fine Art Ceramic Owl Home Decor - Owl Home or Office Decor - "Vermill"
Ceramic Owl Wall Hanging - Owl Wall Art - Ceramic Owl Wall Tile - SECOND - Ceramic Owl Home Decor - Owl Home or Office Decor - "Marcel"
Ceramic Sloth Wall Hanging - Porcelain Sgraffito Sloth Wall Art - Ceramic Sloth Wall Tile - Fine Art Sloth Home or Office Decor - "Sven"